You might think that a guy known as “Monster Man” would be all about the gore, but John Aranza’s favorite thing about Halloween isn’t the extreme scare factor. “The most intriguing part of the holiday for me is getting lost for a day. 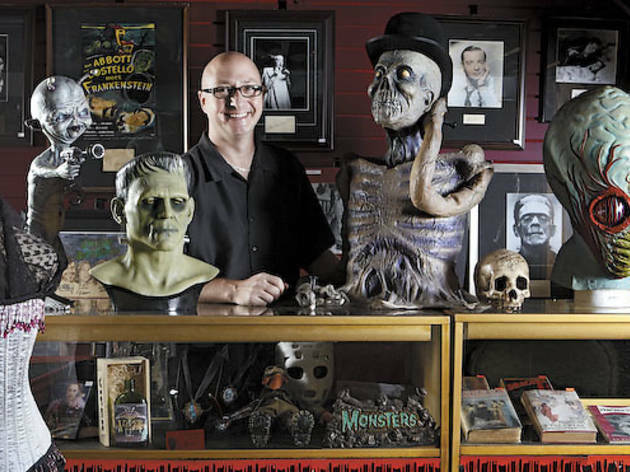 It is escapism,” says Aranza, owner of Berwyn’s Horrorbles (6729 W Roosevelt Rd, 708-484-7370), the ultimate shop specializing year-round in Halloween-style films, costumes, collectibles, memorabilia and other themed goodies. Once an assistant sommelier at the Mag Mile restaurant Spiaggia, Aranza always had an affinity for horror and science fiction, genres that fueled his imagination. Now he “lives and breathes it.” One day when surfing online for a copy of a movie he hadn’t seen, he came across an ad for a convention for horror-film buffs. “I drove with my then-wife-to-be to the convention and it just opened a floodgate,” Aranza remembers. 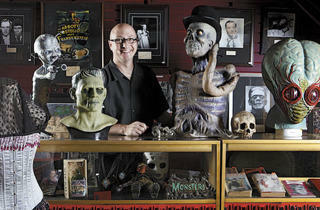 The convention led him to launch an online business, then to the now-six-year-old Horrorbles store, and most recently into expanding Horrorbles’ offerings. The two-story space now has an offbeat art gallery and mini theater space, as well as classroom space to teach the art of being spooky, plus shelves stocked with zombie dolls, custom-made hockey masks, vintage horror movie posters and anything else a fan could want. A native of Bridgeport, Aranza and his wife now also own a restaurant, Autre Monde, next door to Horrorbles. But even with the new business, the influences of the shop are everywhere.